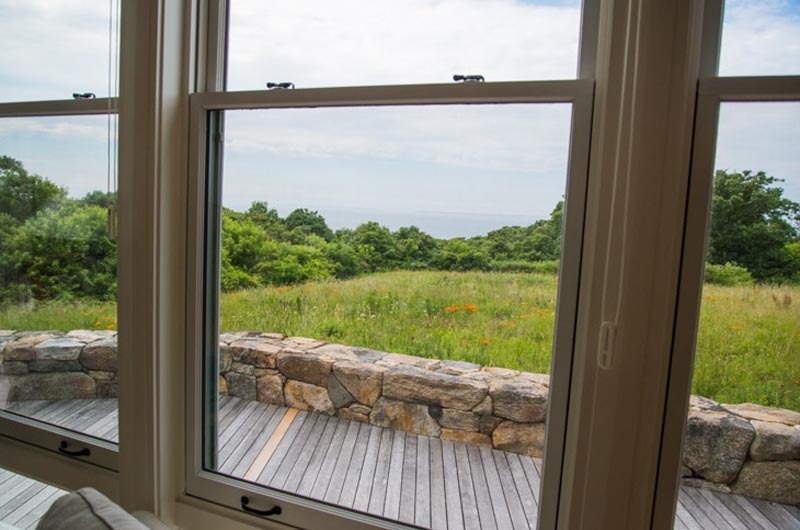 Through the windows of Obama rental home, distant views of Elizabeth Islands. President Obama will return to Martha’s Vineyard early next month for a 16-day family vacation, the White House confirmed this week. It will mark the fifth time during his presidency that President Obama will visit the Island. A White House official said in an email Wednesday that the president and first lady will travel to the Vineyard on Saturday, August 9, and will depart for Washington, D.C., on Sunday, August 24. No public events are scheduled and no further details were released by the White House. But the Gazette has learned that as in past trips, the president will be staying in Chilmark, this time at a new location. The Obamas will rent a private home off North Road in Chilmark that belongs to Joanne Hubschman. Situated in a secluded high meadow dotted with wildflowers and native shrubs, the expansive, three-story summer home has sweeping views of the Elizabeth Islands. The home has an outdoor swimming pool set in an outdoor deck, basketball and tennis courts, and an indoor gym and workout area. President Obama and his family vacationed on the Vineyard in 2009, 2010, 2011 and 2013. They did not come in 2012 during the run up to the presidential election that fall. Mr. Obama also visited the Island a number of times before he was president. His close friend and senior advisor Valerie Jarrett is a longtime seasonal resident of Oak Bluffs; during Mr. Obama’s presidency she has often accompanied him to the Island during his August vacations, staying in her own rented home near East Chop. 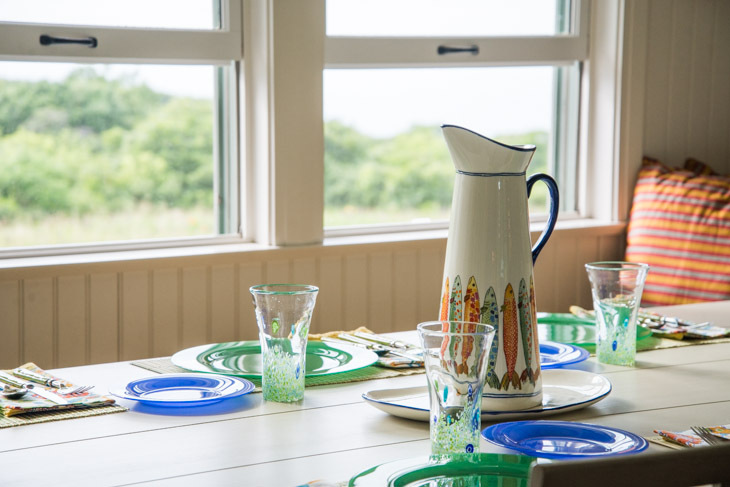 The first family has always stayed in a rented home in Chilmark. For three years, the president rented Blue Heron Farm in Chilmark, a 28-acre estate that borders Tisbury Great Pond. The gentleman’s farm was sold in 2012 to new owners who opted not to rent the property. Last year the Obamas stayed at a private home off South Road in Chilmark owned by David Schulte. The location posed some logistical problems, as it required part of South Road to be closed for security reasons during the president’s visit. This year the Obamas will trade the sandy south shore with its Great Ponds and wide views of the Atlantic for the morainal, boulder-strewn north shore with its long views across the sound to the small chain of Elizabeth Islands that form Gosnold, the seventh town in Dukes County. If history bears repeating, the president and his family will spend their vacation time quietly, with no scheduled public appearances or events. During past Vineyard trips the Obamas visited secluded beaches, rode bikes through the state forest and had meals at favorite Island restaurants, including Sweet Life Cafe and Nancy’s in Oak Bluffs, State Road restaurant in West Tisbury and the Beach Plum in Chilmark. The president likes to spend time on the Island’s golf courses, including Farm Neck in Oak Bluffs, Vineyard Golf Club in Edgartown and Mink Meadows in Vineyard Haven. He has also been known to show up at the Oak Bluffs School to shoot hoops in the school gymnasium. Dating back to the years when the Clintons vacationed on the Vineyard, from time to time national events historically intrude on presidential vacations, and press conferences are held with the Island as a backdrop. During the Obamas’ past visits, Islanders have welcomed the president and his family, posting homemade signs and hanging flags along Vineyard roads and gathering to watch as the presidential motorcade speeds past. In recent years Alley’s General Store has been a favorite spot for motorcade watching, but that will change this year with the change in location for the summer White House. Wonderful news. Martha's Vineyard is going to receive world-wide attention. Nice boost to the businesses here. What an honor that the President would pick our home as the site for his vacation...again! Welcome Mr. President Obama. I don't mind a bit having him come. My pres knows a great place when he sees it! I think they should just stay there. As long as he's on vacation and out playing golf he's not screwing up anything. I think we'd make out better from a financial standpoint if he did just that. Not a lot of running up the national debt if he's otherwise occupied. The problem people have with all of this is that the Obama's act like they're royalty, and vacation accordingly. I saw a Bush comparison made somewhere on here, so here's the low down on that: Bush and his family always went to their Crawford ranch, so once everything was set up at the "western White House", it was a done deal. Mrs. Bush took one trip every year with her girlfriends to go hiking at a camping lodge in Washington state, which was something they had been doing for many years. Somehow, I can't image that costing as much as taking lavish trips to Spain in extraordinarily expensive hotels. And, it wasn't just her. She took a lot of friends and family with her on the government dime, as well as all of the Secret Service detail, vehicles, planes, etc.. Bush played 24 rounds of golf the 8 years he was president, and quit playing at all while our troops were deployed while at war in Iraq and Afghanistan. Obama has already played 40 games. The Bushes never went to stay at 12 million dollar homes that required all of the wiring, computers, phones, etc., that have to be installed for the vacation, and then uninstalled when they left. Summer before last, they took 5 separate vacations, and one of which required a separate plane for the dog to be airlifted to the family vacation destination. it's not so much the vacations that they take, but the way that they vacation at a time when people are struggling financially due to the economy, and we have all of these kids from Central America coming here, and living in actual jail cells in some places for lack of anywhere else to put them. He was within 500 miles of the border where the crisis is occurring, and went to a $10,000 a plate fundraiser at a rich Texas lawyer's estate instead of taking the trip to the border to actually see what is going on. He just seems disconnected from the problems that are going on all around the world and at home, and it just looks really bad for him to dismiss an opportunity to see first hand what is going on, and then next flying off to Martha's Vineyard for yet another expensive vacation. He is constantly talking abut the woes of the poor, and income inequality, yet sees nothing untoward about living like the rich at every opportunity in the taxpayer dime. It's hypocritical. Yes. Of course, they deserve a vacation, but their vacations are always lavish affairs at some very expensive luxury home or resort that they couldn't possibly afford to do on their own dime since the President only makes $400,000 per year, and Michelle hasn't worked at a paying job for five and a half years. One of their vacations costs well over the presidents annual salary. It's the lavishness, and amount of time that they spend on vacations that angers people. They seem to have no regard for how it looks. It's like they feel they're entitled to spend as much of our taxpayer dollars as possible on their trips. Maybe things are different on Martha's Vineyard, but a lot of people are still out of work, and there are a lot of things that need the presidents attention right now. The timing is bad, and it looks bad. A lot of people already think he's unengaged and out of touch. This type of thing just reinforces it. JRowe - I mean no disrespect, but you clearly are out of touch with reality. Please educate yourself with the truth. The wars Bush and Cheney waged were deliberately staged and meant to create "budget busting deficits" to restrict or eliminate social and economic programs important for the middle and lower classes in this country now and for generations to come. Google the "Reagan/Thatcher Doctrine", learn about real wages, wealth disparities, and the political economy of underdevelopment. Perhaps instead of complaining that this hard working family is choosing to relax and enjoy the beauty of the Vineyard, read, "The Price of Loyalty" by Paul O'Neill/Susskind and John Dean's book, "Worse than Watergate". Your response may be very different next time. The Obamas care deeply about YOUR welfare. The Bushes couldn't care less. Have you every seen their sprawling home in Kennibunkport? Nice boost to business?? Those hotels rooms and rental houses would have been filled by families going out to eat, buying ice cream , t-shirts, going on tours etc. Instead we get secret service agents spending little ( except at the bars) Don't forget the visitors who won't come during that time becuase they are under the misconeption that the President brings throngs. He could boost business by coming a few weeks later. Well,so much for getting down with the poor folk...renting an 8,000 sq ft house sure helps him identify with those who are hurting terribly in this country. As long as he can be near his scheming, un-American comrade jarrett, he doesn't care where he is as long as he is spending tax payer money. The "boost" to the summer commercial community, does not, nor has it ever put a cent into my pocket, or yours either I suspect. All they do is make life miserable for most of us for almost 3 months of the year! Did you feel the same way when other Presidents have come to our Island? What did you feel when the Bush Family took their many vacations? The pressures that all Presidents have they must have down time too. Why is it taken for granted by some that one who dislike Obama is a fan of Bush? This moron has had close to six years to make his mark, Bush is not the reason this clown has failed, get over it. This man has destroyed our nation. PS....Bush was a moron too, the last real leader this country had was Ronald Reagan! I agree with John go to the border for 16days to deal with the mess he has caused down there. In addition this President has accomplished nothing in the 6 past years except for maybe running some good parties at the White with Jay Zee and Beyoncé. He did that yesterday. He couldn't make time to go to the border to see what's going on with our humanitarian crisis on Air Force one, but he did have time to go to a $10,000 a plate fund raiser at a rich Texas lawyer's estate last night. Much more important! Bitter lonely person?? Sounded like an informed American citizen to me. Wonder if he will bring a couple dozen newly arrived unaccompanied undocumented future democrat kids with him. His money - he can vacation wherever he chooses. Actually - "We" would spend that no matter where he vacations so why not here? Do you really think the Secret Service wouldn't spend the same money if he went somewhere else? Get over yourself. The Obama’s don’t really have an Island experience when they vacation here. They come and sequester themselves in a huge house that’s very private. I have never seen Mrs. Obama strolling Circuit Avenue in OB for t-shirts. Or taking the Chappy ferry then riding bikes to check out Wasque or Dyke Bridge. Have they ever been to Felix Neck? Anyone seen them surf casting? Every REAL tourist here wants the full Vineyard experience, to see all the sights, to shop, the whole magilla. The President does his annual Bunch of Grapes and ice cream photo op, but really, they could be anywhere USA for what they actually get out of MVY. Caroline - who are you to define an "island experience" and what a "REAL tourist" is? I've been coming and living here for years. One of my cherished memories is disconnecting from my crazy banker job in NYC 15 years ago and spending quiet time reconnecting with my wife and kids up island. It was glorious. And I was a "REAL" tourist to the island then. Peace and solitude is what we needed, and we found it here. My definition of vacation time is seriously different than yours. And as president of the US, and all of the strains and stresses that brings, I'm guessing his definition is different than yours, too. Why not be grateful that our island can offer something for everyone? Tell me Bob, how much MORE peace and solitude does Michelle need???? She's the most isolated First Lady I've witnessed. Why doesn't she take the girls and go volunteer at Habitat for Humanity, or a mission on the border where the new illegals are housed? Are you honestly telling me she and Barack need to reconnect, spending quiet time? I'm falling off my chair laughing. I worked on the Vineyard for decades and catered to the tourist trade. No matter how hectic their life off-island was, no matter how much they needed to unwind, 99.9% visitors or summer residents want to see the sights, walk the streets, people watch, buy some fried clams, watch the sunset - spend some money! Open the wallet. Locals count on that income. And they love to interact with visitors. THAT's the real Vineyard experience. Peace and quiet is nice, but supporting your local merchants is imperative. tell her BillyB!!! That's the beauty of MV! You can have any sort of vacation that you wish!! In the middle of the action, or tucked away getting precious uninterrupted time with family. It's one of the things that has always drawn me to the island. And it's laughable that they'd even suggest my that FLOTUS stroll down circuit. Can you just imagine that traffic jam?! No thanks!! We'll be there in Aug, hope we catch a glimpse! It's a vacation, for goodness sake. What "priorities" do you set for your vacation???? Seriously, who sets "priorities" for a vacation? For me, being with family and friends is a perfect vacation. If the President wants to hang with Valerie, that's cool I guess some people are just miserable. I wish the President and his family a wonderful and relaxing stay on our Island. It's why my family came for years, and why I live here now. Except Winter when I fly to Florida for a few months. LOL. Jarrett doesn't own a porch on the island. She's only an occasional renter, like most of the crew that the off island press tends to portray as being part of the island community. Caroline, well, you showed your colors. A Michelle hater. Personally, I have no space for that in my life. Let the family enjoy their vacation as they see fit. You happen to like going up Circuit Ave. Not all find that a "vacation." Anyway, I've never found any of the Clinton or Obama vacations here a burden. Others whine, I relax and enjoy this Island. I'm glad a couple of presidents find this place as special as my family does. I feel lucky. What a great summer. We just returned from our annual visit to MV (we have done this for 30+ years), and we never do those "tourist" things. We come for the peace and quiet. We go to the beach a lot, find a place to eat dinner in one of the towns--usually Edgartown because there are a lot of places to choose from. We stay away from Oak Bluffs as much as we can, because of the crowds and the made-in-China tourist junk in a lot of the stores, so I can totally understand that the Obama family wants to stay in a more secluded place and just do what they feel like doing. That is what a vacation is for! BF how do you get through with your truthful negative comments when most of us get the special delete button. Seems the Gazette will possibly allow one negative remark for every ten plus Hurrah Obama for coming here, we love you and your fundamental changing that you are doing comments. Boo! Two points: 1) Wherever any president goes, it creates a ton of disruption for the community. This is true whether it's NYC or MV - both of which I have experienced. That's why Camp Davis exists; to give the president a place to go and decompress without causing a hardship for everyone else. Mr. Obama - use it. 2) Obama has been a peddler in class-warfare pedagougy his entire "career", chastising the financially successful and implying that wealth is gained by sticking it to the little guy as opposed to a reward for creating value. Despite this, he's perfectly comfortable getting special treatment and a free dinner at a private club to which I and others worked very hard to be able to afford. The hypocrisy is too much to bear. When he can afford to enjoy these perks based on the rewards of his own production and can do so without clamping down an entire town, I'll welcome him to the island. Until then, please stay away. Bonnie - respectfully, words mean things and you should take care to read them and interpret correctly them before you brand someone an ideologue. My view of the President's policies has nothing to do with the fact the president and his entourage of aides and security is hugely disruptive to any community he visits. That's not an Obama thing, it's an office of the presidency thing. Furthermore, I didn't say "not in my back yard", I said "not in anyone's back yard". This is why Camp David exists. Finally, aggravation regarding the disruption of traffic and the creation of other hassles is not elitist in any sense. I'm pretty sure that both rich and poor folks are equally irritated when a road is blocked off or a bunch of parking spaces in a parking starved community are unavailable due to security. The annual tradition begins of comments pro and con, a presidential visit. Whether it's the Clintons or the Obamas, the usual snarky remarks are made. The same was said over the years in Hyannis and Texas and Kennebunkport too. Sad really. They are hard working presidents taking a summer vacation with their families. The negative comments are embarrassing, no matter what your politics. Best reason to love George W: He took the presidential circus to south Texas for the summer. I cannot think of one good reason to "love" George W. Not that I'm enthralled with President Obama, mind you. Welcome Obamas!! Thank you for your service. Relax however you like. Our family started vacationing here in 1911. In 1930, when my grandparents honeymooned to North Tis, my grandmother said the only thing to do were to play tennis in VH or go to Menemsha to watch sunset. Just ENJOY!!! As Clinton's did....Obama puts MV on the map. I am glad he chooses it. The real estate moves upward when he does. Fact checkers take note.